NFC Group’s RFID, GPS and IoT multi-layered, multi-purpose Asset Tracking, Monitoring, Security and Recovery solutions help you to save time and money, eliminate manual error through automation, reduce your carbon footprint and secure lower insurance premiums. Our solutions bring you up to 75% greater cost savings than other comparable asset management systems. From Industry 4.0 to the day to day running of businesses in every industry, automating and optimising the tracking, utilisation, management and retirement of assets has huge business benefits that positively impact both your top and your bottom line. 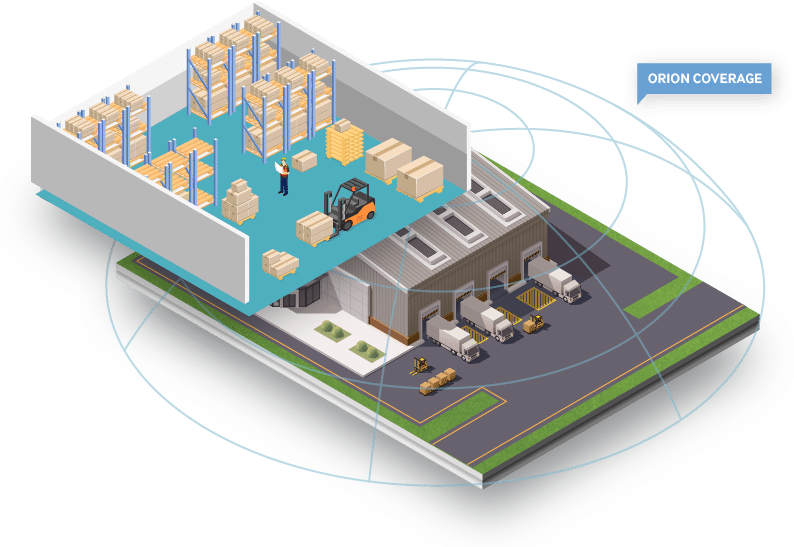 NFC Group creates asset tracking, monitoring, security and recovery solutions with Radio Frequency Identification, GPS and Internet of Things technologies and real-time data, over our Orion Data Network, enabling warehouse, inventory, supply chain, production, transportation and logistics optimisation. Orion feeds back real-time business intelligence so you can make better business decisions that align with your wider business goals and those of your clients, partners and customers. These insights give you the information you need to predict your asset maintenance requirements, carry out inventory in a fraction of the time, optimise your transportation routes, optimise reverse logistics and keep your assets and personnel safe and secure. The result is a connected asset ecosystem that reduces downtime, maximises productivity and lowers your CAPEX and OPEX. How Does the Orion Data Network Enable IoT Asset Management? NFC Group’s Orion Data Network system was designed and built in the UK. This first to market solution increases efficiency by simplifying data communications through a system of GPS and non-GPS tags that transmit their unique identification number and location to a network of Orion gateways. The tags can be customised with a vast range of IoT enabled sensors that measure the condition of your assets including temperature, movement, pressure, level, shock and speed amongst others. The system uses both passive and active RFID for continual background monitoring for spotting bottlenecks and anomalies in your operations to actively tracking and recovering lost and stolen assets in beacon mode with a hand-held RFID reader. Orion feeds back real-time data from the tags, giving you a complete view of your assets, buildings, sites and personnel across the entire multi-supplier supply chain so you can easily manage the lifecycle of your assets, products and component parts from manufacturer, to warehouse, to end user and beyond. Orion hardware is among the smartest technology available in the asset management market. Orion learns the environment and behaviour of your assets by gathering thousands of pieces of data every second. Over time you can spot anomalies and odd behaviour enabling faster reactions, prevention, predictive scheduling, identification of bottlenecks and increased safety and security. There are 3 kinds of Orion gateway. The standard Ethernet is a plug and play version that integrates directly into your existing internet infrastructure. The mobile type of gateway provides mobile network coverage for when your assets are in transit by sea, land and air. When your assets and personnel are located in remote areas, our independent satellite solution gives you global coverage and total peace of mind. Depending on the kind of asset you need to track and whether you need to track actively, passively or potentially both, we create different types of tracking hardware in a wide variety of packaging materials and sizes. For battery powered devices, a penny cell battery lasts around 6-9 months, while an AA cell lasts about 12-18 months and a D cell can last for 5 years or more. The bigger the tag device, the less frequently you need to recharge or replace the battery. Orion tracks your battery charge and sends you instant alerts when it needs recharging or changing. Tracking devices can weigh as little as 28 grams and last for several years on a single charge. You don’t need to worry about hidden or ongoing costs with our Orion solutions as they’re not reliant on a mobile phone network and SIM cards. NFC Group’s asset management solutions are almost infinitely scalable and very cost effective to scale up, as the tags can communicate with any gateway within range. The back-end infrastructure of the Orion Network is focused on user experience and ease of use based on our years of experience in asset tracking and security and on feedback from our customers. Because Orion provides real time visibility into the entire supply chain and allows you to spot issues and streamline your operations from day 1, some customers have reported a return on investment within just 3 weeks. By eliminating waste and maximising the life of assets and components, Orion helps to reduce your businesses carbon footprint, positively contributing to your environmental sustainability strategy. The best way to understand how NFC Group’s Orion solutions can make your asset management more efficient, is to see Orion working for yourself. If you would like a free onsite demonstration, then get in touch with us now to schedule an appointment. Predictive maintenance is set to grow at a CAGR of 28.4% until 2021, and those businesses able to capitalise on these solutions will have the competitive advantage. The various different IoT sensors we can attach to your asset solutions, give you a clear view of your assets’ performance so you can accurately determine their usage and when they will need to have maintenance, what spare parts will be required and when they will need retiring and repurchasing. Manual inventory is slow and error prone. When you automate the process with our Orion RFID solutions you can take a full inventory audit in seconds. In addition to increasing productivity and safety and saving time and money, in sectors such as the emergency services and military ensuring essential equipment is instantly available speeds up response times and saves lives. Containers and pallets are used across all industries to transport parts and end products. From high value assets like works of art, to life saving pharmaceuticals and blood, tracking and monitoring is essential to ensure safe passage and delivery. Optimising your supply chain by tracking, monitoring and recovering your containers, not only protects the cargo they carry and improves delivery times, it also allows you to improve the performance and reduce the cost of ownership of the containers themselves. You can fulfil your regulatory requirements, arrange your supply chain labour more effectively, and enhance your customers’ experience with your brand. At NFC Group we recognise that every one of our customers has different business priorities, goals and challenges. To meet these requirements we design bespoke asset management hardware made from robust weatherproof materials, tailored to each individual project. For example, the H360 Hybrid Asset Tracker is for vehicle use and is powered by the vehicle it is tracking. The D360 and W360 canine and wildlife collars are designed for military, police and conservation use with precise specifications for the lifestyle and anatomy of the animal they are being used to track. We always ensure we have a deep understanding of your business and requirements, so we can create an asset management solution that achieves your precise goals.